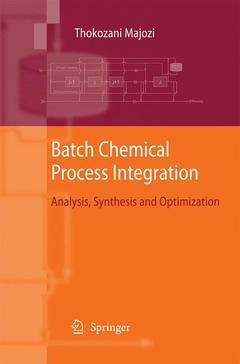 “Batch Chemical Process Integration: Analysis, Synthesis and Optimization” is an excellent source of information on state-of-the-art mathematical and graphical techniques for analysis, synthesis and optimization of batch chemical plants. It covers recent techniques in batch process integration with a particular focus on the capabilities of the mathematical techniques. There is a section on graphical techniques as well as performance comparison between graphical and mathematical techniques. Prior to delving into the intricacies of wastewater minimisation and heat integration in batch processes, the book introduces the reader to the basics of scheduling which is aimed at capturing the essence of time. A chapter on the synthesis of batch plants to highlight the importance of time in design of batch plants is also presented through a real-life case study. The book is targeted at undergraduates and postgraduate students, researchers in batch process integration, practising engineers and technical managers.